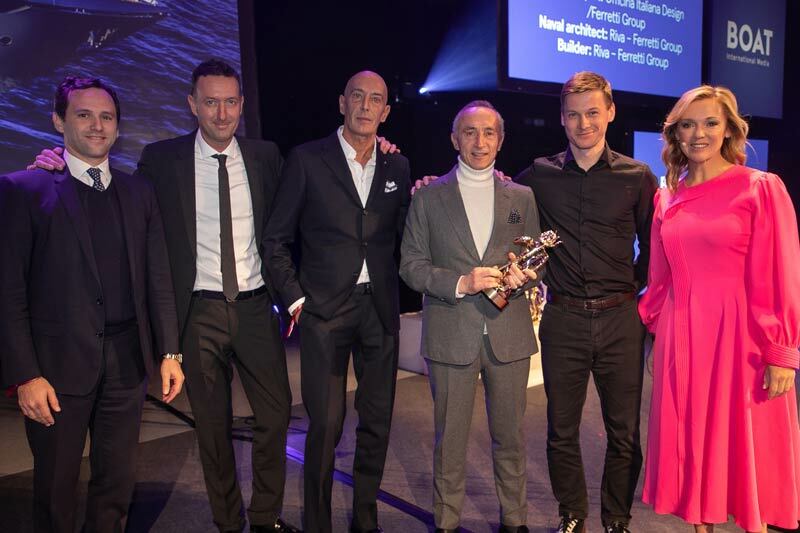 The Officina Italiana Design-penned Riva 110’ Dolcevita has won the prestigious prize Best Exterior Styling Motor Yacht below 39m category at the 10th edition of the Design & Innovation Awards sponsored by the Boat International. The Riva 110’ Dolcevita swayed the jury with an ultra-sporty profile that still delivers exceptionally generous interior and exterior living spaces, and a gloriously aerodynamic allure underscored aft by extensive side glazing. “We are delighted with this award. We believe that the 110’ Dolcevita really does deserve it as it was a commercial success well before it was even presented to the public,” declared Officina Italiana Design CEO Sergio Beretta. “The market welcomed it with open arms because it is a boat designed for people who love the sea and want to enjoy it in style but with plenty of exclusive spaces too. The expansive use of glass also consolidates the great bond between owner and sea”.